ST. GEORGE — Travelers heading to northern Arizona and southeastern Utah for Memorial Day weekend are advised against any outdoor burning as heat and wind pick up. With high winds, low humidity and rising temperatures leading to elevated fire danger, the National Weather Service has issued red flag warnings throughout the region in effect until Saturday evening. Virtually all of northern Arizona is subject to the red flag warning, including major points of interest like the Grand Canyon and Lake Mead as well as areas just south of the Utah-Arizona border, such as the Virgin River Gorge and Colorado City. An approaching weather system will result in increased winds that will lead to critical fire weather conditions along the Colorado River Valley and the Arizona counties of Mohave, Apache, Navajo and Coconino along with the high terrain of Yavapai County. Throughout the region, southwest winds ranging from 15-30 mph are expected, with gusts of up to 45 mph. The National Weather service projects relative humidity values as low as 5 percent in the valleys and 10 to 15 percent in the mountains. 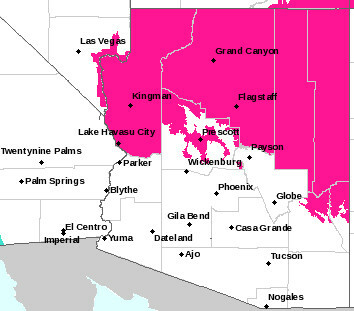 The red flag warning is currently in effect in northwest Arizona, with the advisory going into effect for the northeastern portions of Arizona Saturday from noon to 7 p.m. MST. Much of southeastern Utah is subject to the red flag warning, including such highly visited areas as Arches and Canyonlands national parks and the cities of Green River, Moab and Blanding. The red flag advisory in Utah goes into effect Saturday from 10 a.m. to 10 p.m. MDT. A strengthening area of low pressure will move across California Friday night and stall over the western Great Basin by early Saturday, according to the National Weather Service, which will lead to the development of very dry and gusty southwest winds. Afternoon relative humidity values will drop to as low as 5 percent in many areas with winds gusts of up to 45 mph expected for several hours. In anticipation of increased outdoor recreation during the holiday weekend, fire officials have implemented a number of restrictions throughout regions affected by this weekend’s red flag warning. While the red flag warning is in effect, the National Weather Service strongly discourages outdoor burning of any kind. New fire starts may be difficult or impossible to control due to fast rates of spread resulting from dry conditions and increased winds.